Garnet spends a day with Steven trying to behave unpredictably, attempting to train her future vision to account for the unexpected. Omg the one-eyed kitten sleeping on top of Lion is everything. This was a really touching episode, with Garnet admitting she still wants Steven to be a child and has to start factoring in that he's grown up. I like that upon reflection, in this episode one of her first surprises is of Steven immediately getting that Garnet needs to try random things just to see what happens outside the realm of her foreseeable realities, and that was a clue in Garnet seeing that Steven can understand and decide much more than what she expects of him. And ok so there was a timeline where Vidalia was Lars' mom?? I want to see this! Call back to kitties getting wet! This explains a long-standing question about Future Vision, specifically why Sapphire didn't predict what would happen to her when Rose and Pearl attacked the Blue court delegation. The idea of one of her Ruby guards accidentally fusing with her was so outside the realm of possibility that it was beneath her notice. I suspect that's part of what makes them such a good pair, Ruby's impulsiveness helps fill in Sapphire's blind spots. There's been a noticeable lack of Crystal Gem episodes lately so it's great to see more of Garnet in this episode. This is one of the biggest Garnet episodes in a long time, I strongly suspect Pearl will get a big episode in the near future and I hope there's one for Amethyst too, especially one that updates us on how Amethyst and Peridot are getting along. Also, is this the episode where Steven floats the idea that Pink Diamond wasn't shattered and in fact is still around somewhere? Could be a red herring, but given how Steven Universe dispenses information and foreshadowing it's worth keeping in mind. That episode was My Mother And Yours, Mr. Encyclopedia. Pink Diamond isn't mentioned in any of the other episodes of the four. That kitten. I wonder if that kitten is going to end up being important. Garnet freezes up when staring at it. Also, clever musical joke name for the kitten: "Cat Steven." I think the stuck-in-space thing with Vidalia's son was to imply that, in another timeline, Onion was the one stuck in space. Fandom has been speculating that, in that timeline, Onion deposed the diamonds and took over as leader. That silliness aside, I'm glad to see that almost getting kidnapped by aliens hasn't changed Onion at all. I thought that was about a timeline were Onion was taken to homeworld instead of Lars. ahh ok, I might have misheard Garnet. one more complaint about watching on the app is that while I normally watch shows with closed captioning, they clearly didn't test CC on the app because the black box around the text covers up so much of the screen that I'd rather try and watch it without CC. And they don't give you options to edit how the CC looks like other sites! I was ready for those kitties to, I dunno, have magical powers or be related to the cat fingers episode or something, but no. They were just animals that needed help. 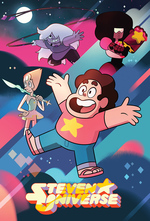 Way to subvert my expectations, Rebecca Sugar.